In February 2015, just two weeks after the approval of the world’s first genetically engineered apple, the company responsible for its creation cashed in — to the tune of $41 million dollars, ($10 million upfront), all for a highly controversial product that most people clearly didn’t want. The company in question, Okanagan Specialty Fruits, had battled protesters, petitions and even the press for months before finally getting approval for its new “genetically engineered apple that doesn’t turn brown,” which was given the green-light by the FDA despite no independent, pre-market safety testing and no feeding trials. Now, after years of speculation, three different GMO apples, as well as pre-sliced apple packages, have hit store shelves, albeit in small quantities. And with no GMO labeling and little to distinguish the genetically engineered version from natural apples, people everywhere are being kept in the dark. As noted by recent news reports including this one by CNN.com, a small amount of Golden Delicious apples that have been genetically engineered by Okanagan were expected to hit 10 stores in the Midwest in early 2017, ranging from February through March. The lack of traceability and accountability is just part of the reason why the apples have been widely opposed in consumer polls; nearly 70% of Canadians did not want it approved. Still, biotech companies have been promoting the GMO apple across Canada as of March 2017, in order to sway public opinion, much the same way that Monsanto and other biotech companies have donated money to schools for pro-GMO, heavily biased “educational” programs (learn more in this article). According to a post from the Facebook page GMO Free USA in fall 2016, a new genetically engineered Fuji apple was approved by the USDA, much in the same way that the original ‘Arctic’ apple was approved in 2015. In total, three new genetically engineered, non-browning apples have been approved: Arctic Golden, Arctic Granny Smith, and now the Arctic Fuji apple. Gala apples could be the next in line as well. The first two were expected to hit store shelves in the U.S. in fall 2016, and now the Fuji apple could join them soon. Fuji apples are the latest variety that have been genetically engineered. 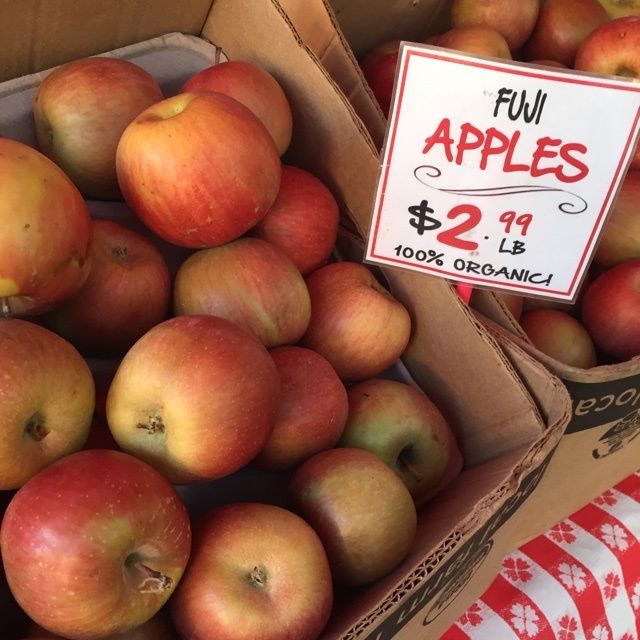 Starting this fall, buying organic is the best way to avoid GMO Fuji apples. Photo via SpecialtyProduce.com. Because of the lack of safety testing, consumers have served as the guinea pigs for what is being dubbed the new “botox” apple. 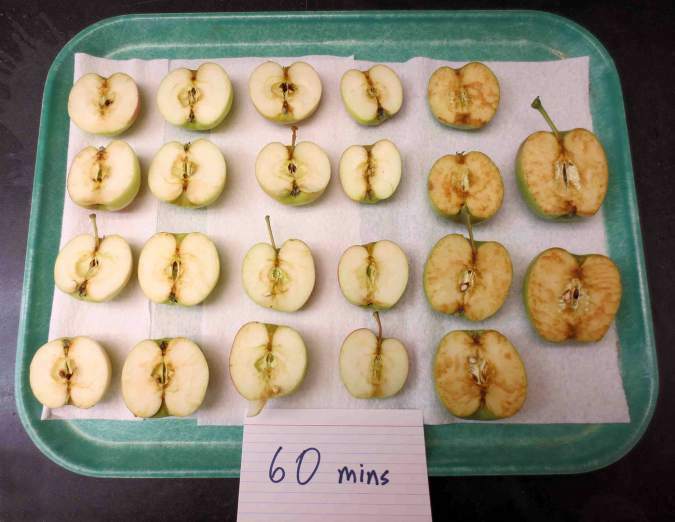 Unlike regular apples, the new GMO apples don’t turn brown when they go bad, leading many to wonder whether or not consumers could inadvertently end up eating rotting, contaminated apples without even knowing it. Following their approval, the Organic Consumers Association launched a campaign to prevent companies from using the unlabeled “GMO apples that don’t turn brown,” and it has made headway, with McDonald’s, Wendy’s and Gerber already pledging not to use them. The biggest target market for the apples, however, will be restaurants and food service companies who want to pass off an expired apple as a fresh, healthy one, which may be good for their bottom line. Pre-sliced apples are often frequently recalled for safety reasons, but no one truly knows how these new GMO experiments will affect the human body. They work by “silencing” the gene that normally makes them turn brown. “This whole thing is just another big experiment on humans for no good reason,” said OCA president Ronnie Cummins. According to the Ag publication CapitalPress.com, about 1,000 to 1,200, 40-pound boxes of Arctic Golden GMO apples were expected to be sliced and sold in grocery stores for marketing purposes in the western U.S. this past fall. The company is growing most of its own apples in the Pacific Northwest, on the East Coast, and in Canada, and also recently just hired more staff in order to gear up for a commercial launch and PR campaign for more non-browning GMO apples in fall 2017. Retailers, food service and quick-serve restaurants have all expressed interest in using the GMO apples according to the CapitalPress report, which means that people eating out may unwillingly become test subjects. Fearing that the new unlabeled GMO apples could hurt their iconic crop’s image and lead to more consumer rejection and confusion (as well as crop contamination), many of the top apple industry players have already come out against them. They include the Northwest Horticultural Council, which represents Washington apple growers responsible for over 60% of the U.S. crop, the U.S. Apple Association, and the British Columbia Fruit Growers Association. While the non-browning apple may be a boon for processed food giants and restaurants or cafes that want to save a buck on the non-browning aspect of these apples, the effects on human health are unknown, and avoiding it may prove to be exceedingly difficult over time if they are allowed to flow through the food supply unchecked. “As usual, this product only benefits the biotech industry and big food processing companies,” wrote The Center for Food Safety on a petition page designed to get more food companies on board with boycotting the new GE apples.